Natalie came to the practice of yoga six years ago and started guiding Strala Yoga after completing the 200+ Strala Ready-to-lead Training in NYC in October 2015. Natalie grew up in Germany and moved to Australia after finishing High School. She fell in love with the country, the easy-going way Australians live by and the stunning beaches (and coffee). Early on she went to finish a Business Marketing Degree and worked in the corporate world, but after a while she was craving more connection to people and the ability to help them feel good. Strala came to her in the right time and after completing her training in New York, she was fortunate to start working with a range of students including business people, athletes, children and lots more. She guides Strala yoga class in Geelong and around the Surf Coast of Victoria, Australia – about an hour drive from Melbourne. 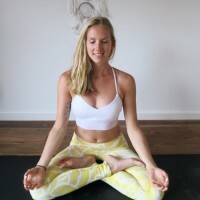 She runs intimate weekly classes out of her home studio in Torquay, and works across a number of gyms, health clubs and yoga studios in Geelong. Her classes are filled with good energy and easy-going movements that leave you feeling relaxed, nourished and inspired. Visit my website to find out more about me and my classes!